Please note: The lift and sliding top tier LSK is not strong enough for storage capabilities. 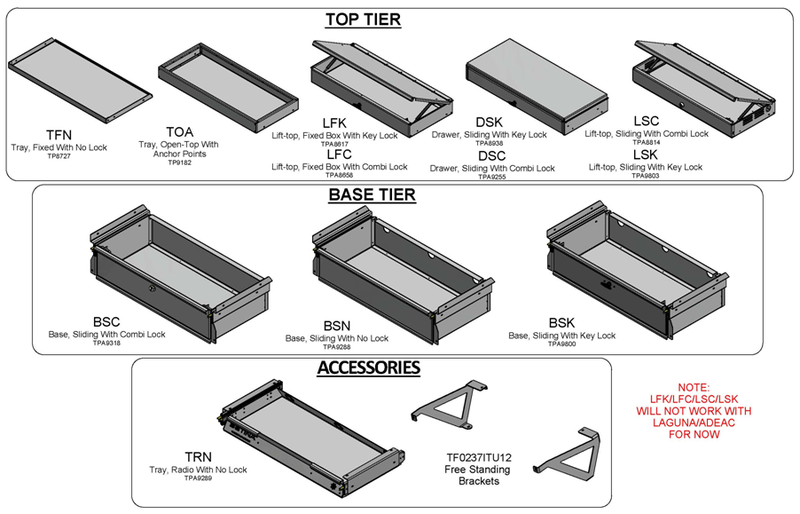 We recommend using either LFK or DSC top tier if you plans to store anything in the top tier, with the exception of radio equipment. Setina's NEW combination Cargo Box provides law enforcement with a superior solution for trunk placement of auxiliary equipment. Made with heavy duty, light-weight aluminum. Universal Design for The 2013 Ford Interceptor SUV. Quick and Easy installation. No Drilling Required. Flexible adjustable and accessible. Setina continues its design innovation with this secure system for weapons and communications equipment. The unique low profile adjusts for quick and easy acces to your gear. REAR CARGO PARTITION OR FREESTANDING BRACKETS REQUIRED. DOES NOT INCLUDE PARTITION. REAR PARTITION IS SOLD SEPARATELY.